I had hoped Kate’s cold would have improved significantly yesterday, but it didn’t. I am glad that it didn’t get worse. She had a good night, no coughing until the morning. Even that didn’t last long. That has been the pattern since her cold began five days ago; however, when she coughs, it is quite loud. Because of that I called the agency that provides our sitters. I arranged for someone come to the house this morning. I am attending a luncheon and need to be there at 11:00. I had planned to take Kate with me. Under the circumstances, I felt it was best that she stay at home. Our regular sitters were already committed to other assignments. This will be the first time that I have had a new sitter without having interviewed her before hand and letting Kate meet her. She will be here at 10:15. I will give her instructions and introduce her to Kate before leaving. If this is like most days, Kate is likely to be asleep when she arrives and continue to sleep after I leave. Kate needs help dressing now, so I will be eager to see how well she accepts the sitter’s help. I am already a bit uneasy about leaving her. The good thing is that we may be approaching the time when I need to add another sitter. It will be good to have someone else who might be able to fill in from time to time. Speaking of sitters, yesterday was my day for Rotary. Kate was still sleeping when Valorie arrived. She walked into the bedroom with me when I told Kate goodbye and that Valorie was here to help her get dressed. She said, “Thank you.” Then she closed her eyes, and I left. Kate had a 3:40 pre-operative appointment with her ophthalmologist in advance of her cataract surgery scheduled for February 12, so I asked Valorie to take her to the office where I met them. Unfortunately, it wasn’t a time when I could talk to her privately to see how things had gone after I left for Rotary. I was waiting for them in the lobby when they arrived. I stood up and walked over to Kate. She didn’t recognize me from a distance. When she got closer, she looked somewhat puzzled and said, “What’s your name?” I said, “Richard” and stopped to see if she said the rest of my name, “Lee Creighton.” She does that sometimes, but not this time. Valorie left, and we took our seats in a separate waiting area for the pre-op patients. There were several other patients waiting and Kate waved and said, “Hello-oh” to them before we sat down. She didn’t do it in a natural way. It was more like someone with some kind of mental problem. I may have imagined it, but I thought several of the people gave her strange looks. No one returned her greeting. We did not see the ophthalmologist on this visit. First, we saw her assistant who explained what we would need to do in preparation for the surgery and gave us prescriptions for three different types of drops we are to use several days before the surgery. Kate was unusually active in our meeting. I think she felt too much of the conversation was between the assistant and me. At one point, she said something that indicated she was the one to get the surgery and would need to know what to do. I was amazed at how well she understood that. She also stopped the technician a few times to ask her to tell her what certain words meant and re-explain what she had just said. It was an interesting combination of wanting to be on top of the situation but not being able to. It reminded me of her continual attempts to remember names, where she lives, or to understand the news she hears on the radio of TV. She wants to know but can’t remember. When we finished, one of the technicians took us to a room where they performed two different scans of her eyes so that they can properly size the implant. Having tried to give various instructions to Kate since she got her cold, I took particular note of the challenges the technician had with her. The first issue was getting her to sit on the stool in front of the scanner. I suspect there were two issues. First, was her eyesight. As with many people with dementia, she often overlooks things that are right in front of her. Second, this was a short, round stool. It didn’t look like a typical chair. After she was seated, the technician asked her to “put your chin right here.” It took a little more coaching for Kate to know where to put her chin. The technician was very sensitive to Kate’s situation and treated her just the way I would have wanted. The scans didn’t take long. We were soon on our way. As we walked out the door, Kate said, “I have no idea where I am.” I told her we were in Knoxville, Tennessee, where we live and were leaving the eye doctor’s office.” Although I had told her about the cataract surgery and the appointment, I know she can’t remember. Thus, the entire process must have seemed strange. I can’t imagine what it was like for her. We went directly to dinner from the ophthalmologist’s office. When we got home, Kate started to work on her iPad while I watched the news. It wasn’t long before she encountered problems with her puzzles. She said, “What can I do?” I said, “I have an idea. Why don’t I put on some music on the TV while you get ready for bed?” She liked the idea. I selected several brief choral videos and then an entire concert by the Wartburg College Choir. She enjoyed it while lying in bed. At the end of the concert, I turned off the TV, and she gradually went to sleep. Several times during the night, she coughed but not for long. She is still sleeping. I don’t intend to wake her before the new sitter arrives. I will introduce the two of them and then let Kate choose whether to get up or stay in bed. I would be very surprised if she wants to get up. I feel like a parent leaving his child with a new sitter. I will be occupied while I am gone, but I am not going to be comfortable until I return home and find that everything went well. It’s impossible for me to describe yesterday in a single word or phrase. A lot of things were going on. I believe and hope the overriding issue was Kate’s cold which had gotten worse during the previous night. The specific symptoms were, at least initially, her cough and her spitting up phlegm. In the middle of the night she had a coughing spell. She had been pretty much cough free during most of the day. I thought maybe lying down might be a problem and wanted to elevate her head with a larger pillow. 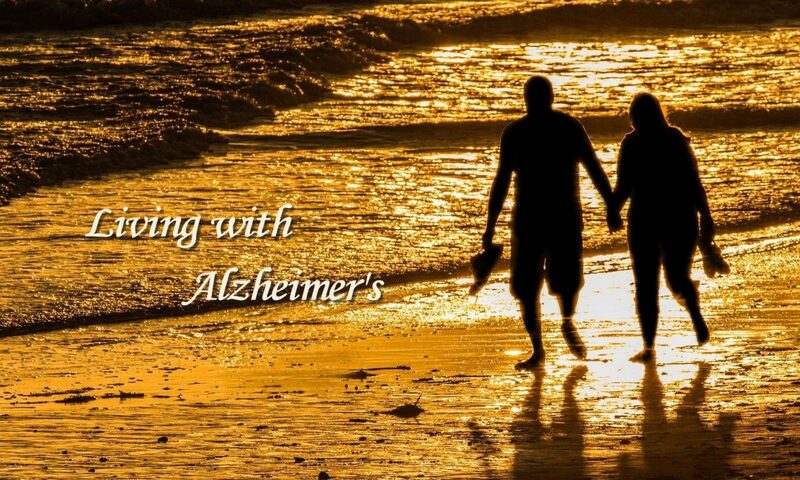 It gave me my first glimpse of what it is like trying to help someone with Alzheimer’s. She doesn’t grasp instructions and gets more confused as you try to explain what you are doing or want her to do. It was a bit frustrating for both of us. This didn’t last long. It may have been less than thirty minutes. She and I went back to sleep. A number of times I have mentioned ways in which Kate and I have been fortunate. One of those is that neither of us has had an illness that has made dealing with her Alzheimer’s more difficult. My experience that night gave me a sense of what some people deal with all the time. It also confirmed for me that as Kate continues her decline, I might very well want help during the night in order for me to get the sleep I need to care for her at other times. I let her sleep yesterday morning. I felt that rest might be the best medicine. She awoke about 7:00, went to the bathroom and went back to bed. From the video cam I had noticed her getting out of bed and went to the bedroom. Her head was more stuffed up than the day before, but she was more clear-headed than usual. About 11:00, I noticed she was stirring. I went to the bedroom. She seemed wide awake but relaxing in bed. I mentioned going to lunch and asked if she were ready to get up. She said she was. I didn’t push her. I let her take her time. She got her shower and got back in bed. I decided to forgo our usual lunch plans. At dinner the night before she coughed quite loudly a couple of times. I didn’t want to disturb anyone at our usual restaurant that is somewhat quiet and reasonably active on Sunday. I decided to get a quick lunch at Panera. Before we were ready to leave, two things happened. First, Kate started coughing. Second, as I tried to get her dressed and take her medicine, I rushed her. I also had to correct her on several things. For example, it took a while for her to take her meds. She would take one and leave the others. I had to remind her several times she had more to take. Finally, she broke down. She said, “I just can’t do anything right.” She was also miffed at me for rushing her. Seeing a panic attack coming, I shifted into a more conciliatory style. That may have prevented a more serious attack, but it didn’t immediately stop her emotional reactions. By this time, I felt it was best to get a to-go order at Panera and bring it back home. The two of us went in the car and brought our lunch back home. It was an interesting change. I think we have only eaten a meal at home two or three times in the past four or five years. We had a very pleasant time at home between lunch and dinner. We relaxed in the family room while Kate worked on her iPad, and I read some autobiographical materials that a former roommate at TCU had sent me. Kate didn’t have any problem coughing and seemed to be getting along well. I felt better about taking her out for dinner. We went to a small Mediterranean café near our home. I knew there wouldn’t be a crowd on Sunday night. Kate was very relaxed and talkative. Soon after we ordered, she said she was glad we had come back. She thought we were in Texas. I made no effort to correct her. She commented about the restaurant and liking it. Then she began to talk about “the girls” and also language differences. Pretty quickly I recognized she was having the same experience she had had a few days ago when she had her massage. At that time, I sensed that she was talking about being at a school in a foreign country. This time it started with a belief that we were in Texas. The rest of what she said was very similar in both experiences. One thing was different. The other day I speculated it might have been the cold medicine that was responsible. That was not true yesterday. She hadn’t had any. Her remarks were not continuous. She didn’t constantly repeat the same things over and over, but she kept bringing them up as though she were continuing a conversation with me. This was something of a challenge. I didn’t want to tell her she was imagining everything. I also didn’t want to make up things to add. I simply acknowledged what she said and agreed. When she said “the girls are smart,” I said something like, “They really are.” This went on until after we were back home. At home, Kate saw her iPad and said, “What’s this?” I told her and said she could work puzzles on it. She was confused about how to open the cover. I showed her. She said, “I hope I know how to do this.” She was confused about how to begin. I showed her and got the first puzzle up. She didn’t know what to do when the pieces were scattered. I ended up completing one puzzle myself just to show her. She worked them for a while before getting frustrated. I decided it might be time for some music therapy. The previous night I received a phone call from another TCU friend and housemate. He follows my blog and is aware of our use of music videos on YouTube. He told me about a two choirs in Lincoln, Nebraska, that I might want to check out. One of those choirs is the Wartburg College Choir. After dinner last night, I found one of their videos of a concert tour in Germany in connection with the 500th anniversary of the Reformation. It contains beautiful music along with correspondingly beautiful churches and other notable sites. It was a wonderful way to end our day. It was like having an hour-long period of meditation. As I helped her into bed, she said, “Richard, it’s been a frustrating day. <pause> I’m so frustrated.” I assured her that she could count on me to help her. We didn’t say anything more. This was one more reminder that Kate still recognizes that she has a problem even if she doesn’t know what it is or where it leads. Kate’s cold was a little worse yesterday. The good news is that she was in a good mood, and her cough occurred only periodically. She had one loud cough after we sat down for lunch but didn’t cough again until much later in the day. Even then her coughing was very infrequent. She slept late but no later than on any other day. Our server at lunch had just about given up on us when we arrived close to 1:00. The most obvious sign that she is sick is that she is wiping more saliva and phlegm from her mouth than usual. I wish I could say all of it goes into the paper towels and napkins she uses. The truth is that she wipes a lot on her clothes. This happens all the time, but I am more sensitive to it now that she is sick. I want to avoid getting whatever she has, but it is going to be hard to protect myself. I washed my hands a lot yesterday and used hand sanitizer. I am also trying to avoid coming in contact with her clothes and hands, but that is tough. She rested a couple of hours after lunch but didn’t appear to go to sleep. She also went to bed somewhat earlier than usual and without any prompting from me. She wasn’t asleep when I got in bed. That is beginning to be common. She slept well until 3:00 this morning. That’s when she started coughing. It must have gone on close to thirty minutes though it seemed longer to me. After breakfast, I glanced at the video cam and saw that she was getting out of bed and looked confused as to where to go. I went back to the bedroom. She was looking for the bathroom. She used the toilet and brushed her teeth. In the process of brushing, she got her night gown wet. I got her another and put her back in bed. I suspect she will sleep until at least 10:30, perhaps later. I had planned for us to attend the regional Metropolitan Opera auditions at a local college today. We have enjoyed going the past three or four years. They begin at 10:00, but I didn’t even think of trying to get there that early. I thought we would catch the last couple of hours this afternoon. Now I am doubtful about that. I don’t want to risk Kate’s coughing as well as passing along her cold to anyone else. That’s a shame because it is something she has enjoyed immensely, and it’s hard to imagine that we will be able to attend next year. Yesterday I was reminded of how many lives are affected by dementia when I tried to reach a childhood friend and neighbor. I discovered she is now in memory care and unable to communicate. I am always saddened by news like that. I am also thinking about a family member whose birthday is today. He was the husband of one of Kate’s favorite cousins. He is someone else who lived with dementia. We lost him five years ago. I have fond memories of conversations with him at Franklin family gatherings. We were both newcomers to the family and because of that connected in a special way. Every caregiver knows many of the daily tasks are routine. Along with those are a few unexpected things. They can be uncomfortable. We had one of those yesterday afternoon. As I have noted before, one side effect of Aricept is diarrhea. We have controlled that with an antidiarrheal. That has worked well. In the past few days, however, I’ve had the impression that Kate might be experiencing a little constipation. I’ve asked her about it, and she said she wasn’t. I have learned that she is often wrong about things like this. With that in mind, I decided to skip her antidiarrheal night before last. Yesterday afternoon she had a minor problem with loose stools just as we were about to leave for her massage. She wanted me to show her where the bathroom is. I was surprised when we got there. She wanted me to tell her what to do. I showed her the toilet. She didn’t recognize it. I explained that she had to lift the lid. She was quite puzzled, so I lifted it for her, told her to drop her pants, and sit down. She said, “It’s got a hole in it.” I told her they were made that way so that one could urinate and defecate through it. Once she was on the toilet, I left her. Very shortly, she called me. When I got to her, we were both upset, but for different reasons. I felt terrible about not giving her the antidiarrheal and thought she was upset about her accident. In the process of helping her, I discovered that she was upset about something totally unrelated. This was one of those times that she began to talk as though we had been involved in something together. Thus, she thought I would understand what she was talking about. For me, it was like walking into an ongoing conversation and trying to figure out what in the world she was talking about. What I heard first was, “I’m so sorry. It’s all my fault. I’m sorry to get you involved.” I felt bad and said, “It wasn’t your fault at all. It was all my fault.” She said, “Well, we both wanted to do the right thing.” As she continued talking, I got an entirely different, though never clear, understanding of what she was talking about. It was when she said, “I really wanted to help these people” that I understood that she wasn’t thinking about her diarrhea. It turns out that she imagined (my word, not hers) that she was working in some kind of overseas program helping the poor. I knew from past experience that it makes no sense to ask questions for clarification. That never works. It was better for me to play along as though I understood exactly what she was saying and why. She continued to feel she had done something wrong. I tried to change her focus. I suggested that we both were trying to do something right and that things don’t always go the way you want them to go. She accepted that but never fully calmed down before we got to the spa for her massage. As soon as we were inside and saw her massage therapist, she looked somewhat calm, but tired. After her massage, she and the therapist came out to the lobby. Kate was telling her therapist about this project she was working on. She mentioned how much the people need help and that they were smart. She expressed the importance of the project. I let her finish, and we turned around to leave. As we walked out the door, she said to me, “My husband is working on it too. And he is really patient and can relate to them.” She continued telling me about her husband until we reached the car. I opened the car door, and she got in her seat. Then I leaned down to connect her seat belt, and she recognized me and said, “Oh, Richard, do you know him?” I told her I did. She said, “He’s a really nice guy. What’s his name?” I told her I didn’t know. This may be a good place to interject that until she started talking about this project before we left home, she had seemed quite “clear-headed.” She hadn’t been especially talkative, but she seemed to know me as her husband and used my name several times. She has imagined things quite a few times over the past several years, but this talk about the “project” came on so suddenly that I was surprised. She talked about the project all the way home. It was clear that my earlier thought was correct. She was talking about some kind of educational program in a foreign country. The only thing I can imagine that might have prompted this delusion is our experiences with two different trips with Overseas Adventure Travel. One was to Tanzania, the other to Peru and Ecuador. OAT has schools in both places and always takes its groups to visit them. When we got home, she wanted to use the bathroom. When she came out of the bathroom, she asked me what she should do. I suggested that she work on her iPad in the family room, and I would join her. I put on some music and we relaxed there for an hour before going to dinner. When we returned to the house, she worked puzzles on her iPad. I’ve mentioned previously that she is having greater difficulty working her puzzles. Last night she seemed especially confused. She couldn’t figure out how to work her puzzles and wanted me to work them for her. That seemed a bit strange, but she has wanted me to do that a few times in the past. I soon discovered that she did that because she thought we were choosing a puzzle to frame it and give to someone. She had a specific person in mind, but she couldn’t tell me who. She said it was somebody I had told her about. She wanted me to show her how to do the puzzles herself, but I tried in vain to teach her. I focused heavily on trying to get her to recognize the edge pieces, especially the corners. As hard as I tried, she never grasped it. The good thing was that I was able to make her feel better. She thanked me profusely for helping her. She said I was the only one who recognized that she was smart. She commented specifically on the trouble she was having at that moment and the fact that she didn’t seem the way she usually is. That is one more sign of things that she is able to sense while being so seemingly “out of touch” with reality. The more she said, the more I began to think that she might be experiencing a reaction to Robitussin and/or Zyrtec. She started coughing night before last. I called her doctor yesterday morning. She suggested both of these medications. I told Kate about my suspicion and did not give her the evening dose. I have since done a little exploration of the side effects of Robitussin and found that diarrhea is one of them. That could mean that my not giving her the antidiarrheal the night before may not be the cause of yesterday’s accident. I also noticed that I bought Robitussin-DM. When I did a search on dementia and Robitussin, I found something on the Alzheimer’s Association website that indicated that “DM” is contraindicated for people taking Namenda. That is one of Kate’s medications. Kate’s doctor had suggested either Robitussin or Mucinex. I think I will switch to the latter today. Because she was having so much trouble, I got Kate to put away her iPad for the night and loaded Les Misérables in the DVD player. She watched intently for the next hour and didn’t want to stop for bed. She slept through the night though she is coughing a little bit this morning. She is still in bed, and I am using my new video cam to check on her. I have discovered that the audio is particularly effective. After her first cough, I went to the bedroom. She coughed again, but it didn’t sound nearly as bad hearing it directly. Today the sitter is supposed to come at 1:00. I am going to call the agency as soon as they open and cancel. I want to be able to monitor how well she is doing throughout the day. What Kate and the sitters do has changed since I first engaged them a year and four months ago. That was a time when Kate and I were accustomed to going to Panera more frequently. We went almost every morning and some afternoons. When I arranged for a sitter, I bought a Panera gift card and told Kate and the sitter that they could go to Panera anytime they wanted. I remember how Kate’s eyes would light up when I said that. She looked at Panera as an outing. That was true even when it was just the two of us. With the sitter, I think it was also a way of breaking up the time until I returned. That worked beautifully for almost a year. It began to change when Kate started sleeping later, and we weren’t going to Panera as often. I might have guessed that would make an afternoon trip even more appealing, but it didn’t. Like many things, I am not sure why. When I returned home, I often found that Kate was resting or had rested a lot while I was gone. That bothered me because I felt she wasn’t getting enough stimulation. At the same time, I was looking for other ways to entertain Kate in the evening when we returned home from dinner. Our regular routine was for me to watch the evening news while she worked jigsaw puzzles on her iPad. I wanted her to have something else to entertain her, especially since she was beginning to have difficulty working her puzzles. I bought about ten DVDs of musicals that I thought she might enjoy. We would watch about an hour a night. Watching musicals like Les Misérables and Fiddler on the Roof could easily take us six nights. Kate loved it. She clearly has favorites. We watched Les Misérables seven times in one seven-week stretch last summer. As I became more concerned about Kate’s time with the sitter, I decided to try the DVDs when the sitter was here. That also worked well. It was entertaining for both Kate and the sitter. I liked the idea of their engaging in something together even if it was a passive activity. Gradually, I expanded the musical performances we watch at night by going to YouTube. Their selections are endless and growing all the time. The key is finding something that Kate will enjoy. During the fall, that meant a lot of Christmas music. I also discovered that The Tabernacle Choir seems to have one of the largest libraries of music videos. There are plenty of others as well. I often search for a particular singer, for example, Julie Andrews, Barbra Streisand, Sarah Brightman, Andrea Bocelli, The Three Tenors, etc. My next step was to set up the YouTube videos for the sitter and Kate to watch. That has also worked well. One time during the Christmas season, I had set up one of the Christmas videos by the Tabernacle Choir. It was about an hour in length. I told the sitter she could turn it off at the end of the program. I also mentioned that if she didn’t, it would continue with other videos. When I got home four hours later, they were still watching Tabernacle Choir videos. They hadn’t stopped the entire time I was gone. They were both happy. Since then I have been preparing something for them to watch at least once a week, sometimes more. Yesterday was one of those days. I selected a Bill Moyers documentary about the hymn “Amazing Grace.” It was about an hour and twenty minutes. As I have done before, I told the sitter that she could turn off the TV after the program was over or let it roll over to other videos. When I got home, they were both still watching the videos. “Amazing Grace” was over long before. They were now watching musical flash mobs. This is something I hadn’t thought about. If I had, I would have probably searched for them. Instead, they had simply come up according to the algorithm used by YouTube. Mary told me that Kate rested a couple of times during the videos but kept coming back. I suspect that was a result of her liking some more than others. The important thing is that I have found a source of amusement for Kate apart from her iPad. The bonus is that it also helps her pass the time while I am gone. At the moment I am not planning to have a video every time the sitter comes, but once or twice a week might work well. Yesterday Kate and I had a nice day although it began with her not knowing that I am her husband. She got up on her own after I had played about fifteen minutes of soft music. My video cam alerted me to the fact that she was getting up. I went back to the room where she greeted me very normally. She asked about her clothes, and I told her they were on the chair beside the bed. As I helped her up from the bed, she said, “Are you my daddy?” I told I was her husband. She was surprised but did not seemed especially disturbed, just confused that she didn’t know/remember that. I decided not to make an issue of it and walked her to the bathroom where she took a shower. On the way she asked again if I were her daddy. When I said I wasn’t, she asked, “Where is he?” I said, “Texas.” She said, “Where are we?” I told her we were in Knoxville, Tennessee where we live. She looked puzzled but did not say anythng more. After her shower, I helped her get dressed. This was one of those times she wanted to do things herself but kept asking for my help. I don’t recall our talking again about my being her husband until we were at lunch. She was in a playful mood and teased me a bit. In response to that, I said, “I would marry you again if I could.” She reacted as though that would be terrible. I said, “You wouldn’t like that?” She gave me a look that I interpreted as “Are you kidding?” Then I said, “We could just keep on living together.” She reacted quickly with a disapproving look and said, “I’m surprised you would even say that. What would your mother say?” Isn’t it interesting how powerful such feelings are? This is coming from deep within the recesses of her mind. In the course of our conversation I mentioned our children. She asked their names and wanted me to tell her something about them. We never got back to talking directly about my being her husband, but it became clear that she recognized that and was happy about it. I think I have mentioned that she is sometimes confused about the words she wants to use. Sometimes she uses a word that is obviously the wrong one. Often she recognizes it is wrong and will say, “You know what I mean.” Sometimes I do know. Sometimes I don’t and say so. Other times I say I know when I don’t and hope that when she says more, I will understand. Yesterday I was surprised when something new happened. She didn’t understand the meaning of two words I used in our conversation. The first occurred when I said that someone we saw at another table looked like a student. She said, “What’s that?” I helped her understand by reminding her (she doesn’t remember) of the time she was teacher. It wasn’t long before she asked me what the men at the next table were talking about. I told her I didn’t know, but it looked like they were businessmen. She said, “What’s that?” Then I explained what a business is. The night before she asked the wife of the couple we had dinner with what the child at a nearby table was holding. She told Kate that it was a phone. Kate asked what she was doing with it. She explained that the child was probably playing a game. I suspect part of Kate’s not understanding what the child was doing relates to her eyesight. I can’t tell how much relates to her Alzheimer’s and how much is a result of the cataract in her left eye. Twice yesterday afternoon, she saw her iPad and asked me what it was. I told her it was her iPad, and she said, “What do you do with it?” I told her she could work jigsaw puzzles on it and opened the program for her. She continues to be able to work her puzzles, but it is getting more difficult for her. It is like many other abilities. Sometimes she gets along fine. Other times she runs into problems. All of these things signal how much her world and mine are changing. I can’t help wondering what life will be like six months from now but not really wanting to know. It has been a year and four months since I first got a sitter to be with Kate for four hours three days a week. I put off making the decision to do this a long time. I was concerned about how Kate would respond. It seemed to me that she felt pretty secure that she could take care of herself and, thus, didn’t need someone to stay with her. When I told her minutes before the sitter’s first visit, she asked me why the person was coming. I told her I would feel more comfortable not leaving her alone. She said, “Oh, okay.” That was it. With only a few exceptions, she has not seemed to mind having a sitter since then. Yesterday was one of those. I had tried gently to wake her in time for her to shower and dress before the sitter arrived. I didn’t push because I have learned that if she didn’t want to get up, Valorie could take care of helping her. At 11:15, she asked if she could stay in bed a little longer. I told her that was all right. When Valorie arrived, I went back to the bedroom and told Kate that she was here and that I was going to the Y. She gave me a disapproving look but didn’t say anything. Valorie walked in the room to say hello, and I said my goodbyes. When I returned four hours later, they were both seated in the family room. Kate was resting with her eyes closed. She didn’t show any sign that she was glad to see me. Valorie got up to leave and said goodbye. Kate didn’t say anything. As I walked Valorie to the door, she told me that she had helped Kate get to the shower and dressed. She said that twice Kate was very abrupt with her and said something like, “I can do that myself.” Valorie said when that happened, she backed off and let Kate do it on her own. I could easily envision what happened. I told Valorie she is sometimes the same way with me. In this particular case, I believe Kate might have been more demonstrative than usual because she was bothered by my having left her. After Valorie was gone, I went back to Kate and told her I was glad to see her. She said, “I’m glad to see you too.” Her tone of voice led me to translate that to “Boy, am I glad you are here.” We didn’t say anything more at that time. Later as we were going to dinner, I said, “I really enjoy being with you.” With some emotion she said, “I enjoy being with you too. <pause> I feel comfortable with you. I feel secure that you won’t let anything happen to me. I feel safe.” This is not the first or the second time she has said things like this. I don’t think she is afraid of being the object of an aggressive act by someone. I know that most (almost all) of the time she is unsure of where she is and what is going on around her. I am the constant helpmate for her. She has a feeling of complete trust. When I am not with her, she loses that sense of security. I believe that is especially true when she has a sitter with whom she has spent considerably less time than she has with me. I have two emotional reactions to the situation. I feel like having a sitter less often. This is a case in which I will let my head take charge over the emotion. In the long run, I am going to need more help from sitters, not less. I think this is just a rough spot in the road. It isn’t one that should alter my overall plan. The other emotion is a feeling of responsibility. I feel she needs me more now than ever. I want to make sure that the rest of her life is as smooth as it can be. That feeling was reinforced by a brief conversation we had last night. We went to dinner with a couple we know from our music nights at Casa Bella. We ate at a new German restaurant near their house. We had never been there before, and I believe Kate was a bit uneasy. We got a durprise when we walked in. There is a bell connected to the door of the entrance. It has a surprisingly loud ring each time the door is opened. Kate is very sensitive to noises. (I scared her the other day when I turned on the faucet in the laundry. The sudden noise of the water frightened her.) The bell shook her momentarily. The menu items were very different. She initially tried to read the menu but quickly gave up. She had trouble following our conversation and had to ask questions to help her understand. She often asks me to slow down when I am talking to her. Following three other people, each of whom is a talker, is an impossibility. I really felt for her. When we got in the car to go home, she said, “Richard, (yes, she remembered my name) I don’t understand what is happening. I’m so confused.” I asked if she could explain a little more. She couldn’t. I told her I wanted to help in any way I could. I reminded her of our wedding vows, specifically the part about “sickness and in health.” I told her I would always be with her. She said she understood that and has never doubted it. I realize, of course, that we attach different meanings to that. I know where we are headed. She doesn’t, but she does know she can count on me. I intend to honor that promise.